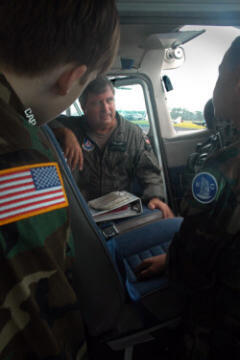 8/18/2009–Oak Island, NC–The North Carolina Wing of the Civil Air Patrol (CAP) has established a new unit at the Brunswick County Airport in Oak Island, NC. Under the command of Lt. Col Dennis Faver, the Brunswick County Flight’s initial open house netted 12 senior members (many of whom are pilots), and seven cadets. In conjunction with Wilmington’s Cape Fear Composite Squadron, the Flight has also conducted ten cadet orientation-ride sorties from the Brunswick County Airport in the last two weeks. Retired from the U.S. Army, Lt. Col Faver is a flight instructor for Red Sky Aviation at the Oak Island airport. The airport director provides meeting space and ramp services as a courtesy for the new flight. The impressive response from the community shows the area’s strong support for the Civil Air Patrol and its role in providing positive opportunities for teens in its cadet programs; its Search and Rescue operations; and the Aerospace Education programs provided for both teens and seniors. With its airport access, the new Flight will provide a tangible role in coordinated ground and aerial search and rescue missions for the North Carolina Wing’s southeast region.